Business receipts are a sad fact of life, like taxes and Justin Bieber. Shoeboxed helps you capture, organize, and file your receipts, and does so through the magic of apps, photography, and real-life humans. Available for Android and iOS, the Shoeboxed app works like this: Using your smartphone's camera, you snap a photo of your receipt. Done! No, seriously, that's the whole process. The app automatically uploads the receipt image to Shoeboxed, where a bona fide human spot-checks the accuracy of the scanning and OCR. Once it's confirmed (and/or corrected), the data is downloaded to your phone. This turnaround isn't instantaneous--in my tests it took about 10 minutes--but I like this approach a lot better than manually checking and correcting the data, which is what most receipt-tracking apps require. What's more, all your receipts are automatically synced to the Shoeboxed Web site, where you can view everything in a lot more detail and export the data to just about any format under the sun: Quicken, Excel, Evernote, FreshBooks, etc. 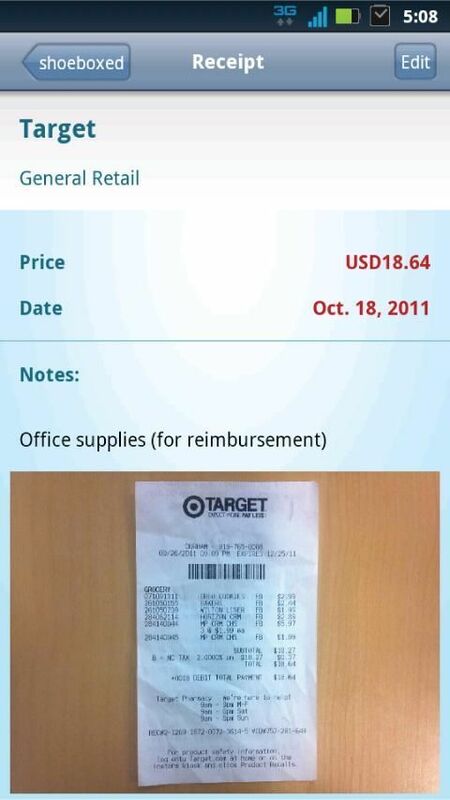 If you need to file one or more receipts right away, the app lets you e-mail them; it generates a simple table of the data and attaches images of the receipts themselves. That's a great way to shoot your travel expenses to Accounting so you can get reimbursed quickly. The Shoeboxed apps are free, and you can use them without so much as setting up an account. However, you're limited to just five "scans" per month. If you sign up for a free account, verify your e-mail address, and so on, you can earn up to 15 bonus credits. Beyond that, you'll need one of Shoeboxed's premium accounts, which start at $9.95 per month. If you travel a lot and are tired of dealing with the hassles of saving and filing receipts, that might just be the bargain of the century. If you've found a receipt-management app you like better than Shoeboxed, by all means tell me about it!